On second thought, maybe Big Red would like this card? My first thought as well. Sneak/Breach 9-12 looks welcome in a deck that lacks cantrips. If you put Emrakul into play with the Boar, wouldn't that skip the Annihilator trigger? Because I'm pretty sure it does since both are attack triggers, except Emrakul is already past that point when she's put into play. Living Twister is a GSZ-able Seismic Assault (although alot more mana intensive). The body is pretty sturdy to boot. Could this see play in 4C Loam as a GSZ target? I also wonder why they made the tapped land restriction. Even if an untapped land is target of LD, you could always tap it for mana in response and then return it. Maybe I'm missing something like corner cases, but that seems like an unnecessary design hoop you have to jump through. I also wonder why they made the tapped land restriction. Even if an untapped land is target of LD, you could always tap it for mana in response and then return it. Maybe I'm missing something like corner cases, but that seems like an unnecessary design hoop you have to jump through. Early thoughts are to prevent misclicks on MTGArena - so basically there so you don't accidentally return a land you hadn't used yet. I think considering things in this way is the future of design; more mandatory triggers and other things that will streamline the way the game plays out on Arena. So the paper gets bent around the shittiness of Arena's interface. As somebody pointed out on Twitter, the Boar combines rather well with Master of Cruelties for a potential instakill. Worldspine Wurm is most likely an instant kill too, except it's actually good on it's own off of a Sneak or Through the Breach, whereas Master of Cruelties is crap without Ilharg. Why wouldn't you play Zoo? Instead of a 5/5 for B that's immune to Push, you can get a 4/5 for 1G that's not. And instead of a 3/2 flyer for U, you can get a 3/3 double conditional for G. Oh, and you also get to not include the two best colors in Legacy, or any of the best spells, and you're a dog to combo. There is already a thread for posting your bad opinions friend. I prefer to think it was an intentional choice to stop Lands players from saving Dark Depths, Tabernacles, and Mazes from wasteland. See, they do care about legacy! It's already present for the last few sets. They even changed Ajani's Pridemate. So far this hasn't been bad, for what I know. But in some regards it could impose limits to what they're willing to do. I see the importance of streamlining the (digital) gameplay and preventing unintended clicking mistakes. Let's just hope it doesn't lead to too much dumbing down the game. All glory to the Hypno Boar God! Funny, Ilharg acts as replacement for Hazoret in the god cycle in this set. How long does WotC plan ahead again? 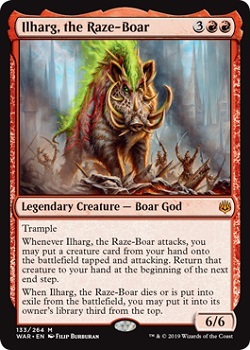 :) Is the myth of the Raze Boar a newer retcon or has it been part of Gruul since the first Ravnica set? What's better than one Jace TMS on the battlefield? Two Jace. There's probably a combo to be had somewhere, but doubling up on JTMS seems pretty win-more. The fact that it can copy a legendary but won't be legendary itself is a very interesting effect. I'm curious if there is some sort of way to abuse that part. My thoughts exactly. We have never had this ability before in a single card. I can't even recall the last time I considered buying a box of Standard legal cards, but man, I am really contemplating a box of this set. There are some really interesting mythics, rares and a slew of uncommons I'd like to just have. Copying Ugin and Dovin come immediately to mind. Thalia. Elesh Norn. I think the "walker with extra loyalty counter" might be more important, but I can't think of any off the top of my head. My immediate thought is copying different Ajanis in a Superfriends build.